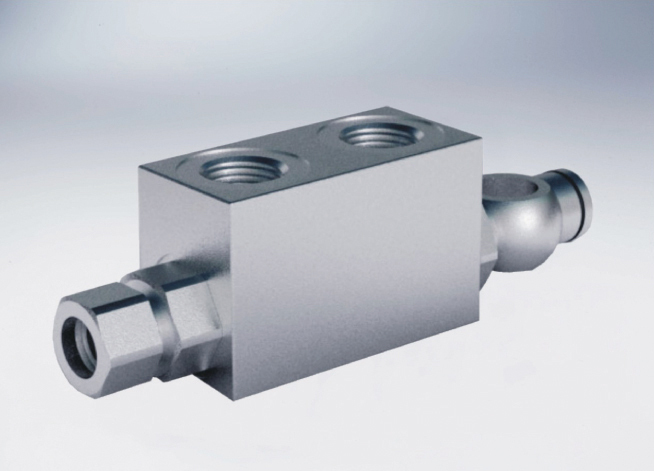 Pilot check valves are used to block the cylinder in both directions. Flow is free in one direction and blocked in the reverse direction until pilot pressure is applied. This valve is ideal for very short distance centre cylinders. The check cartridge serves also as fixing banjo, allowing after nut releasing a 90 regulation. Connect V1 and V2 to the pressure flow, connect C1 directly to the cylinder through the 3/8" screwand C2 to the cylinder through the banjo.